It has been a bit more than 3 months now that the Google Earth plugin ceased working. GEFS had to clearly break off from this legacy and will now become GeoFS. I believe the name reflect the global geographic scale of the flyable area while not being to far from what it used to be. 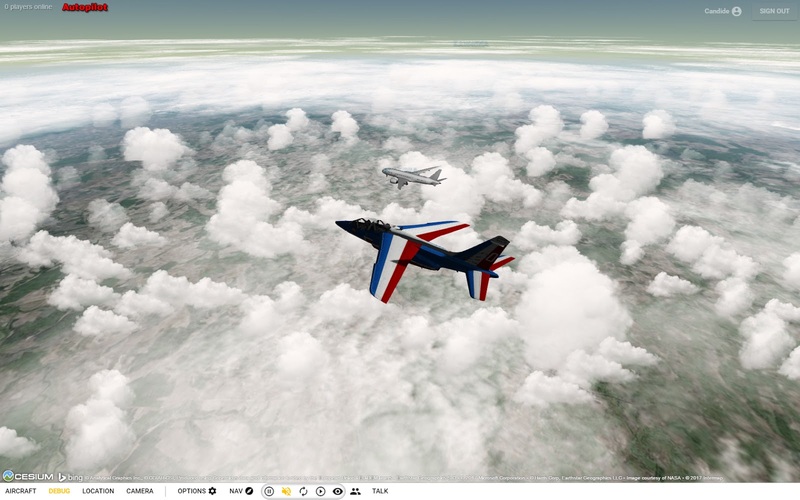 GeoFS, so far, offers to fly two new aircraft: the Alpha Jet "Patrouille de France", a beautiful model originally created for Microsoft Flight Simulator by Laurent Correia and a Cessna 172 modelled by David Moratilla. I also added a simple ADS-B feed to track commercial trafic in-game: you can fly with real trafic and follow aircraft as they cruise around the globe. I am planning to improve this feature with more aircraft models and hopefully more accurate data. The clouds are back in GeoFS: Based on real time weather data, the cloud coverage is generated as you fly, all over the world. Finally, you can now log-in using your Facebook account as well as your Gmail account. Please visit (and like) GeoFS facebook page for the latest news and screenshot. Hi! Xavier Tassin, you will put the mig, warthog and stealth planes on the geofs? Can you make the planes with the pilots in the cabin? Hey! Xavier Tassin can you add a southwest airlines 737. My game will not have noise?